To start working with this module you need to install it. The module can be installed in the Control Panel of your website -> "Inactive" tab. If you select without content you will have a full-featured module that you will be able to use as you like. Module name by default will be "Online Games" but it can be changed in Control Panel in module settings; there you can also customize fields for adding of new entries. Default phrases for the module can be changed in the "Substitution of default phrases" section on the main page of Control Panel. 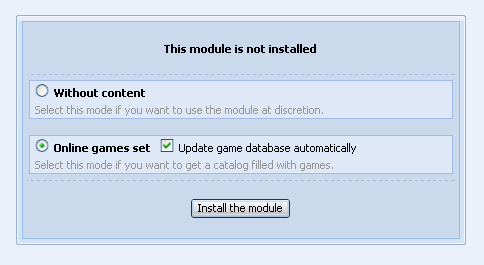 If you select Online games set you will not only get a full-featured ready-to-work module, but also content with the possibility of its regular updating (the option "Update game database automatically" during installation). The default set includes games of various genres and categories – online games, downloadable games, mobile games. 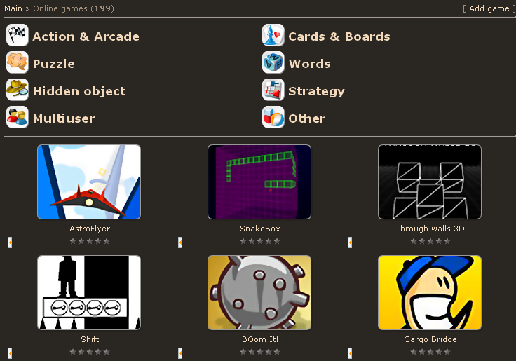 You can edit/delete all default content and add your own games. The new module "Online Games" is one of the most general-purpose modules. It has such possibilities as adding of sections, categories, filters; a lot of additional fiends; new features added by default. Module templates have the new rating system by default (in the form of stars). There are 12 different image sets, each of them is available in 4 sizes. $IMGS_ARRAY_JS$ is realized in the module – in the form of screenshots on the page with entry full text and its comments. When adding an entry, you fill the field "Images" by means of uploading your images which are then displayed as thumbnails on an entry page. After you click on such thumbnail, an Ajax window with all images of this entry will open. Indeed, Thanks for sharing this. SirDarknight(Tonmoy), Thanks for sharing this!